Calms hyperactive stress response Modulates epinephrine and norepinephrine Promotes calm Calm PRT combines ingredients designed to relieve stress and restore proper communication within the hypothalamic-pituitary-adrenal (HPA) axis. 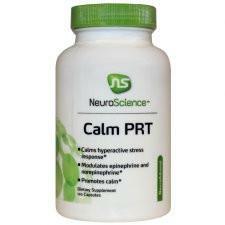 Calm PRT contains Rhodiola rosea extract standardized to contain high-dose, biologically-active rosavins. In this high dose, Rhodiola rosea has been found to decrease the effects of a hyperactive stress response. Calm PRT also contains SerinAid®, a high-quality preparation of phosphatidylserine. Phosphatidylserine is a major component of cell membranes and is thought to restore sensitivity to desensitized cortisol receptors within the HPA axis. This, in turn, helps reset the stress response and decrease cortisol levels. The formula also contains glycine and taurine for additional calming neurotransmitter support.